Download our attorney-drafted Free Will Kit today. Without a last will and testament, the court will decide the outcome of your estate and possibly the guardianship of any minor children you have. This can be prevented with some basic planning and using our attorney drafted free will kit. What can you do with our free will kit? Leave assets to your surviving spouse or any other beneficiary you choose. Set up a trust fund for children. Decide who will be the guardian of any minor children. If you ever need to make changes or update your last will and testament, youcan easily do so with this kit, anytime you wish.... free of charge. In our free will kit, you will receive all the forms and step-by-step instructions you need to easily and successfully prepare your own last will and testament. This will kit was designed to be used by almost any person, in any state, to easily prepare their own last will and testament. Our will kit was drafted by a licensed practicing attorney and when filled out properly are valid in all 50 states. 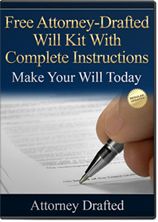 Our will kit includes specific will forms that will cover most general situations. Whether you are single, married, widowed, with or without children. Both you and your spouse can use the same will forms. It's always a pleasure dealing with professional people who care about treating people "right". You certainly have done your part in taking care of any concern I may have had. The Free Will Kit is a super deal. No doubt about it! The easy to follow instructions and forms make filling them out a breeze. The additional free forms and information is just an added benefit - a great buy! Keep up the good work - feel free to use my testimonial in your ad...... I mean what I say! Thanks again for your very generous offer. No need to worry about giving out your personal information on-line. With our free will kit, you do not have to fill out your forms on-line. You can download and fill them out in the privacy of your home. The forms can be filled out with pen or filled out on your computer. Simply follow the attorney-drafted instructions, and you can have your last will and testament completed in 60-90 minutes...it's that easy. Download Your Will Forms in a Completely Editable Text Document. This text document can be fully edited and customized on your computer.